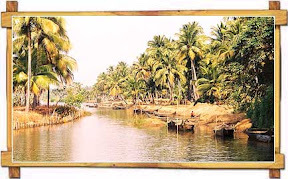 A prosperous commercial town, Kollam lies on the Ashtamudi Lake heavily fringed with coconut groves. In ancient times, Phoenician, Persian, Arab, Greek, Roman and Chinese ships touched the port here. 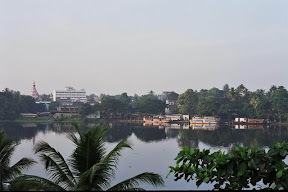 Kollam figured prominently in the early history of Christianity in India. 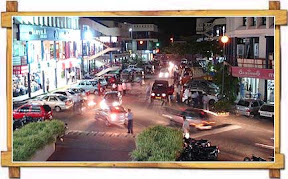 The present day Kollam is famous for it's varied modern industries, cashew nut processing and research, fisheries, etc. 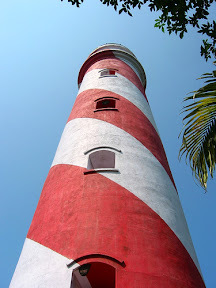 Varkala (39 KM): A seaside town and a pilgrim center. Courtallam (104 KM): A charming health resort, Courtallam is located in Tirunelveli Dist of Tamil Nadu. There are 9 important waterfalls in Courtallam. The best season is from July to Sept. Acco:Hotel Tamil Nadu (TTDC), Tel: 04633-22423, M'bai Contact Tel:4110118 (Tariff: A/c. Dbl. Rs.700/-, Non A/c. Rs.400-450/-). Tel:4110118 (Tariff: A/c. Dbl. Rs.700/-, Non A/c. Rs.400-450/-). Area : 16 Sq.KM Altitude : Sea Level. Temperature : Summer Max: 35.0 Deg.C. Min: 25 Deg.C. Winter Max: 33.5 Deg.C. Min: 24 Deg.C. Season : October to March. STD Code : 0474. 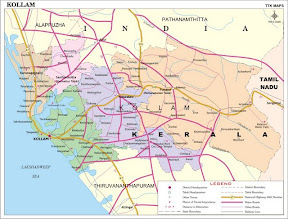 Rail : Kollam is connected by rail with major cities and towns in the country. Fare: Mumbai-Kollam II A/c. Rs. 1997/- & II Class: Rs. 461/-. Alleppey Tourism Development Council (ATDC) & District Tourism Promotion Council (DTPC) operate backwater cruises from Boat Jetty, Kollam to Alappuzha (Dep: 1030 hrs. Daily, Fare: Rs. 150/-); Alumkadavu (Dep: 1030 hrs. Daily, Fare: Rs. 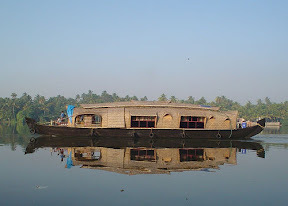 100/-); DTPC Backwater Village Cruise (Timings: 0900-1330 hrs. & 1400-1830 hrs. Fare: Rs. 250/-); Canal Cruise to Monroe Island (Timings: 0900-1300 hrs., Fare: Rs. 300/-). 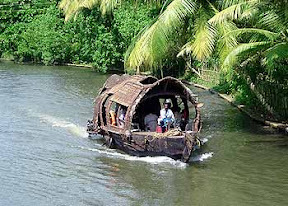 DTPC also operates exclusive house boat holiday packages. South Paravoor, Tel: 512410-17, Fax: 512104. 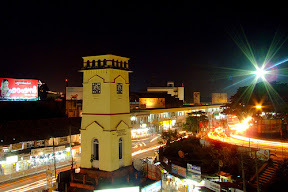 Parameswar Nagar, Tel: 744322. Fax: 740480. Chavara South P.O., Tel: 0476-882288. Fax: 882470. Kadappakada, Tel: 749287. Fax: 749287. Paravoor, Tel: 514300. Fax: 750170. Tariff of the following hotels range from Rs.100-300/- for a Single room and Rs.200-500/- for a Double room. Yatri Niwas (KTDC), Ashramom, Tel: 745538 (Tariff: Sgl. Rs. 165-385/- & Dbl. Rs. 220-440/-), Govt. Guest House, Tel: 742630 (Tariff: A/c. Rs. 200-500/- & Non A/c. Rs. 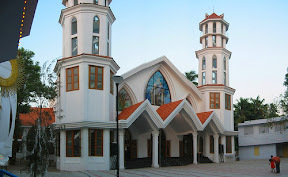 100-150/-), PWD Rest House, Kollam, Tel: 742838.